Books are compact storage vessels for collected information or objects. They represent thought or a record of thought, what was once considered to be fact as well as current idea and theory. Whenever I purchase a used book I hope to find notes in the margins: mile markers to point out something to the reader or to enhance the memory of the owner. Often the significance is only to the person leaving the message, and from this voyeuristic frame I only have part of the clue. It is more mysterious when scraps of paper; receipts, flowers, notes or photographs are tucked within the book. These bits of information are entirely out of place; yet link the book perfectly to the intimacy of the object and previous owner. 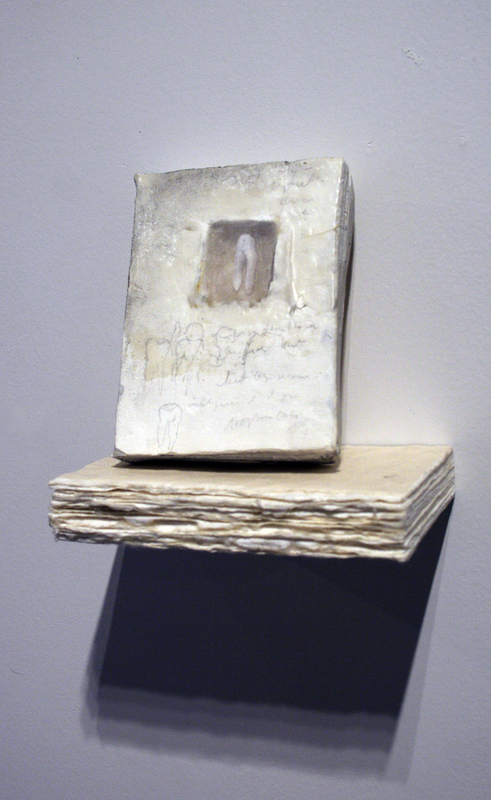 My mixed media porcelain books are vessels for objects I interpret as important, bits of personal collections stored away for safety but ultimately forgotten.